We get a lot of people asking us if October is “too late” to be planting anything. Fortunately our mild climate allows us to plant almost year-round. However, you still need to be aware of what you’re planting to make sure it will survive a frost or freeze. It’s also best to avoid planting during extreme conditions to avoid transplant shock. Keep in mind it will take newly planted plants longer to become established and they will grow a lot slower because of the colder weather. While you won’t see huge rewards right away, because of them growing slower, remember that you’re giving them a huge head start for spring. Snapdragons are a great example. I’ve always thought snapdragons planted in the fall look stunning in the spring because they’ve had all winter and early spring to get established which makes them nice, bulky, and full by the time they start blooming. This time of year is also a great time to clean things out. I’ve talked about it before and right now is a perfect time to guiltlessly rip out anything that you watched suffer all summer long. Perhaps it was a perennial that once looked great and now looks woody and half dead, or maybe it’s a section of your landscape that just needs a make-over. Either way now’s the time to do it. You’ll have all winter to dream about what you want to put in its place and you will have a clean slate when you’re ready to plant something new. 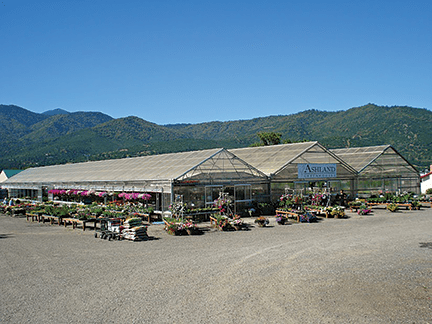 While you’re visiting Ashland Greenhouses be sure to take a look at the poinsettias. Each week starting in October and on through November they begin to turn colors. It’s fun to see how much they change in such a short amount of time. Be sure to write down on your calendars the Poinsettia Festival. It will be held this year on November 25th 10am – 4pm.